Amazingly simple and fast to use. Just roll a string of fondant or gumpaste, insert into mold, apply pressure to mold, open, and release a fresh string of beautiful pearls, flowers or beads. Working on a lightly dusted silicone mat, roll fondant into a rope that is longer and the diameter larger than the bead maker design. Open Fat Daddio’s bead maker and apply dusting powder, cornstarch, or powdered sugar to the inside with a brush. Place on top of the fondant rope. 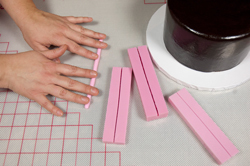 Allow the beadmaker to close around the fondant. Press all the way around the mold to be sure to get a stong impression. 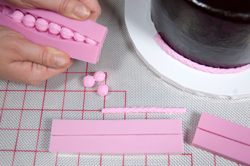 Using a plastic pastry knife or offset spatula scrape excess fondant from the bead mold. Open the bead maker to release the fondant beads. If the beads stick, allow fondant to sit a few minutes, or add more dusting powder before removing. 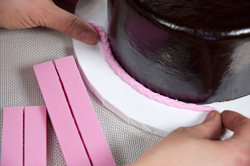 Attach the strings using piping gel or water to fondant cakes, or directly to buttercream, whipped, or cream cheese icing. Great with any edible paste or non-food craft application. 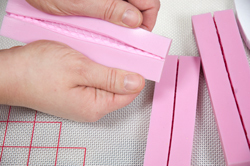 Make strings of fondant beads, ropes, and roses faster.